Dear Mom, Happy Days Photos! This photo always makes me smile! 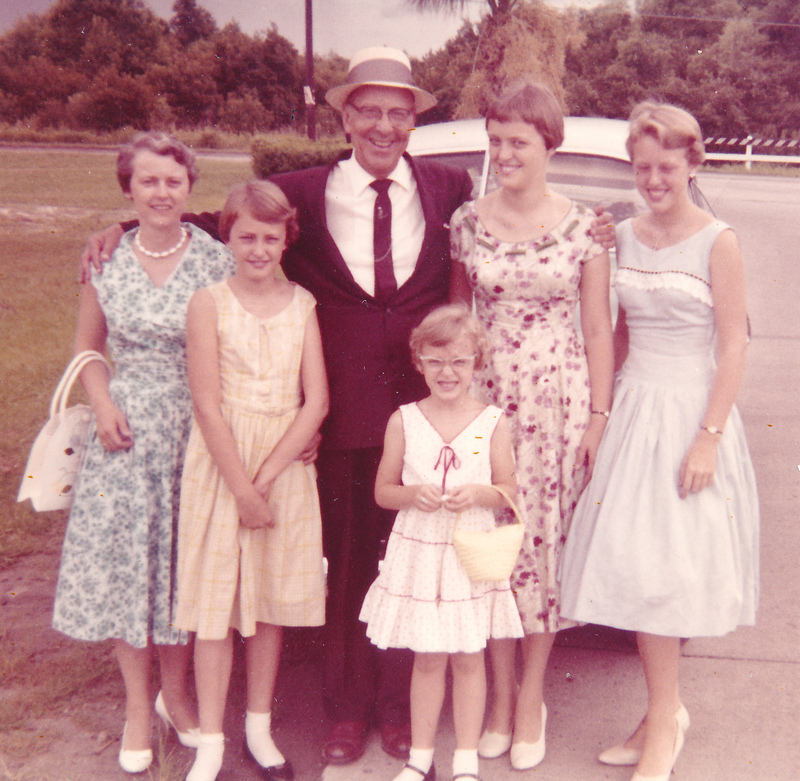 I don’t think I have another photo of all of us together with Grandpa. With the exception of our double wedding in 1965, I don’t think he visited us in Savannah except this once. He looks super dapper in his Sunday suit, starched white shirt with tie, and Palm Beach hat! This is one of the few photos I have of you with all four of us. I think Sister #4 is 5 years old. You and she are the only ladies carrying proper handbags in the proper manner. I’m 15, going into my last year of high school. Diane is 10; Sister #2 is probably 14. Those high heels were killing my feet–all pointy toed, with no arch support. But vanity is vanity, and I had plenty of it. One huge clue here is that I’m not wearing my glasses! I don’t think I’m wearing stockings, either, because it’s summertime and the heat and humidity are up there. See that hairdo on me? Do you remember the day I came home from high school dripping with sweat and asked you to cut it off? Short and straight, with no permanent! I was fed up with damp sweaty hair and having to wash it every night and put it in rollers. You protested a bit, but in the end you did it. I loved it short then and I still love it now. You can tell which of us are grown-up ladies. We’re in high heels, and we’re wearing wrist watches. The younger set have sweet ankle socks and flat shoes. I remember how envious Sister #4 was of Sister #2 and me. I don’t think Diane cared a bit. I think she was happier romping around outside and helping Dad with odd jobs. The dresses also make me smile. A little of this and a little of that, style-wise. I think mine was a hand-me-down. One I liked enough to wear. Sister #2, in light blue with sweet lace and ribbon, looks especially lovely thanks to her up-to-date crinoline half-slip. All the rage back then. Especially when you sat down at your wooden school desk and your crinoline peeked out! I can’t imagine how you made all those clothes for us and for yourself. Plus costumes for special programs and occasions. You also took apart hand-me-downs and even store-bought outfits and altered them to fit each of us with our peculiar shapes and challenges. 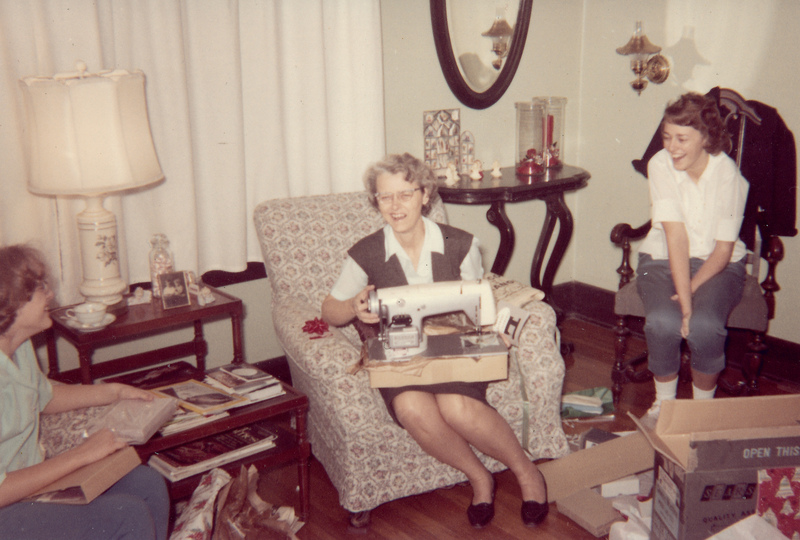 We sisters all went together and gave you this beautiful Sears Kenmore sewing machine. Your first brand-new modern electric machine. The look on your face says it all–as does the look on Diane’s face just behind you. That’s Sister #2 on the left. We didn’t often manage to surprise you, but this one was super-fun to pull off! This photo reminds me that you loved fixing up the house with touches of art and old china and furniture arranged just so. You had a way of taking assorted old bits and pieces and putting them together in a hospitable, welcoming way. I think you reupholstered the chair you’re sitting in. I also see your little Christmas cherub candles and an Advent calendar on the side table behind you, and a small photo of Dad as a child with one of his siblings, on the lamp/magazine table. Well, that’s all I have for now. Happy memories of happy times. Great pix! Thanks for sharing! Hey, Kathy! Thanks for looking! The pics are quite pleasing to me. Diane always enjoyed working outside. So true about Diane. I’m glad you’re enjoying the old photos–especially of Diane in her pre-Clay years!